New Frontiers in Ocean Exploration: The E/V Nautilus, NOAA Ship Okeanos Explorer, and R/V Falkor 2017 Field Season is the eighth consecutive supplement on ocean exploration to accompany Oceanography. These booklets provide details about the innovative technologies deployed to investigate the seafloor and water column and explain how telepresence can both convey the excitement of ocean exploration to global audiences and allow scientists as well as the public on shore to participate in expeditions in real time. The supplements also describe the variety of educational programs the Ocean Exploration Trust, the NOAA Office of Ocean Exploration and Research, and the Schmidt Ocean Institute support in conjunction with schools, museums, visitors centers, and aquariums, as well as internships that bring high school students, undergraduates, graduate students, teachers, and artists on board ships. Through these supplements, we have explored the geology, chemistry, biology, and archaeology of parts of the global ocean and seas. We hope you enjoy this booklet and share it widely. Raineault, N.A, J. Flanders, and A. Bowman, eds. 2018. New frontiers in ocean exploration: The E/V Nautilus, NOAA Ship Okeanos Explorer, and R/V Falkor 2017 field season. Oceanography 31(1), supplement, 126 pp., https://doi.org/​10.5670/​oceanog.2018.supplement.01. 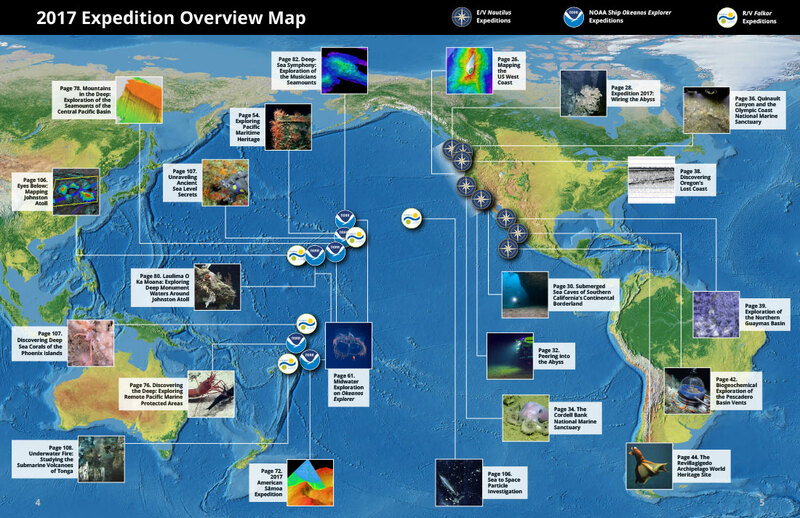 Support for this publication is provided by the Ocean Exploration Trust, the NOAA Office of Ocean Exploration and Research, the National Marine Sanctuary Foundation, and the Schmidt Ocean Institute.